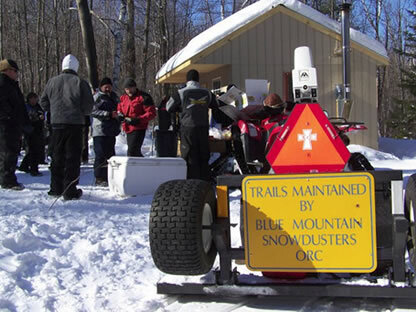 Blue Mountain Snow Dusters, O.R.C, Inc. Happy New Year everyone! I’m kind of new at this so bear with me as I try and provide our first club update in what we believe is a very long time. It has been a busy fall/early winter for the Blue Mountain Snow Dusters. I am happy to report some of our existing members have re-committed themselves to the club and we have picked up several new members to help out with the various club responsibilities. Maintenance on our 1989 Tucker and two Skandics has been completed. Landowner permission forms have been gathered. Our website has been updated with a new interactive trail map. Trail maintenance is ongoing and we are working on getting our 65 miles of trails signed for the season. I want to thank all of our volunteers and landowners for making it all possible. While there is always more to do, we are definitely moving in the right direction! Our trail maintenance this fall included a new bridge that will allow for a trail re-route through our town recreation fields. Also working with the Springfield club and landowners we are pleased to report the trail between Grantham and Springfield along route 114 has been re-opened after being closed for the past several years. Thank you to all of the landowners and volunteers who were able to make this happen. This will allow much easier access to the Springfield, Canaan and Lyme trail networks from the Grantham area. Our trails are open! Some of the snow we received during December survived the warm spells to form a decent base. We were able to get out with the Tucker over New Years and groom much of our trail network. It is certainly early season riding, but after not being able to open the trails at all last season, it has been great to get out and see sections of our town that are really only accessible during the snowmobile season. Hopefully Mother Nature will cooperate and give us a good old fashion New England snowstorm. Previous post: Update to Online Trail Map!